Note: I wrote this review in March 2006 and it was posted at the time to an online site which is no longer available. I had a recent conversation with a friend about New Covenant Theology and shared this review with him. I thought it would be worthwhile to re-post the review for others who might be interested. I also recorded an audio version of the review and posted it to sermonaudio.com (listen to it here). Richard C. Barcellos. 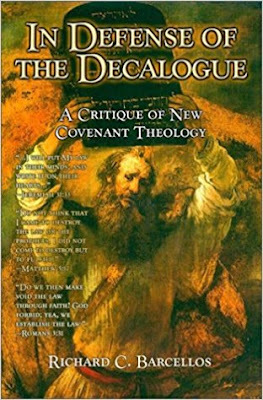 In Defense of the Decalogue: A Critique of New Covenant Theology. Enumclaw, WA: WinePress Publishing, 2001, 117 pp. New Covenant Theology (NCT) is a recent attempt to find a middle ground between Covenant (Reformed) and Dispensational theology in the areas of ecclesiology (the relationship between Israel and the Church) and ethics (the relationship between law and grace). Most central, according to Barcellos, is the issue of the continuing function and role of the law (and the Ten Commandments in particular) for Christians. NCT sees no continuing role for the Old Testament law in general and the Decalogue in particular for New Covenant believers. Barcellos’ book offered this critique even before a definitive work by NCT scholars appeared on the market [That work has since appeared: Tom Wells and Fred Zaspel, New Covenant Theology: Description, Definition, Defense (New Covenant Media, 2002)]! First: NCT’s view of the promise of the New Covenant. The contention here is that NCT misreads Jeremiah 31:31-34 by assuming that the “New Covenant” “will be the death knell of the Decalogue as a unit”, rather than ‘the death knell of the Old Covenant” (24). Second: NCT’s view concerning the identity of the Old Covenant. Here the author takes NCT to task for equating the Decalogue with the Old Covenant. Instead, Barcellos argues that “the Decalogue is still binding as a unit under the New Covenant, though not in the same manner in which it was under the Old” (40). Third: NCT’s views related to the abolition of the Old Covenant. The primary bone of contention here is the proper interpretation of Jesus’ words in Matthew 5:17-20. Counter to NCT, Barcellos argues that the Old Testament is still binding, “but not in the same way it used to be”, since its application is now conditioned by the coming of Jesus (65). This argument is buttressed by appeal to Ephesians 2:14-16. He concludes this unit: “The abrogation of the Old Covenant does not cancel the utility of the Old Testament” (69). Fourth: NCT’s perspective on the Sermon on the Mount. Barcellos contends that, “Christ is not altering the Law of Moses in the Sermon on the Mount, but rightly applying it, unlike the scribes and Pharisees who were hypocrites” (76). Fifth: NCT’s position on the identity of the Moral Law. At core here is an exposition of Romans 2:14-15. According to Barcellos, NCT contends that nine of the ten commandments (excluding the 4th commandment to observe the Sabbath) comprise “the Moral law common to all men” (77). Barcellos sees no reason to exclude the 4th commandment from the Moral Law as it is made known to the Jews through special revelation and to Gentiles through general revelation. Barcellos contends that NCT holds to the maxim “Not repeated, not binding.” On the other hand, “The historic Reformed hermeneutic assumes continuity between the testaments unless rescinded” (85). His point: Just because each of the Ten Commandments is not explicitly repeated in the New Testament does not diminish the fact that they are still binding. Seventh: NCT’s implications for canonics. Barcellos’ warning here is that though NCT may give formal recognition of the complete canon (Old and New Testaments), it results in an ethical approach that functionally acknowledges only the New Testament. NCT, therefore, “leaves itself open to the accusation of Neo-Marcionism, due to its reductionistic, myopic, and truncated approach to ethics” (88). Eighth: NCT and historical theology. Barcellos begins by defending the position on the law, often chided by NCT, taken in the Second London Baptist Confession (1689). He then attacks two areas where NCT has claimed historical support for its position. First, NCT has looked to the so-called “continental Reformers” for support of its Decalogue and Sabbatarian ideas. While acknowledging that Calvin’s views on the Sabbath, in particular, are complex, Barcellos concludes that NCT “does not bear the mantle of John Calvin when it comes to the issue of the Sabbath” (100). Second, NCT has often appealed to the writings of John Bunyan on the Sabbath for historical support for its ideas. In fact, an annual gathering of NCT-sympathetic pastors and theologians is called “The Bunyan Conference.” Barcellos, however, contends that NCT has misread Bunyan who “was not combating the Puritan view of the Sabbath” “but writing against a movement that sought to impose the seventh day Sabbath as Moral Law upon Christians” (101). He concludes, “Fairly stated, John Bunyan is not New Covenant in his view of the Sabbath” (107).